In a post last month about neither was vs. neither were, Liz Potter looked at hundreds of real-life examples from the British National Corpus and found that neither in singular and plural uses occurred about equally often. Reviewing more recent corpus data led her to conclude that the plural use could be gaining the upper hand. A singular or a plural verb may feel more correct with neither in a given context – it often depends on what kind of elements are being coordinated, and in what order. This may lead us to favour one type of agreement or another. Neither plan is perfect is the only option for that construction, but we can say neither of these plans is perfect or neither of these plans are perfect – both are grammatically fine, though formal English favours the singular. There is an important distinction here between formal and notional agreement. Formal agreement demands strict numerical agreement: neither of these plans is perfect; four pounds are all I have; the team was successful. Notional agreement is looser, and can correspond to the overall sense rather than the explicit number: neither of these plans are perfect; four pounds is all I have; the team were successful. Both kinds of agreement have their place, but prescriptivists sometimes reject examples of notional agreement. This makes concord (as it’s also known) an occasionally contentious part of how we put phrases together. Over-obedience to formal agreement leads to phrases like: a number of files is missing, because number is a singular noun. But multiple files are missing, so a number of files are missing is more commonsensical. 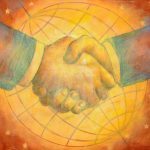 Agreement can be tricky, and lapses can happen through inattention or the complexity of some examples: *The combined cost of all these reports, studies, workshops and seminars are higher every year. That should be is higher because the antecedent, cost, is singular. The problem arises through false attraction or the proximity effect – the verb does not agree with its antecedent because it’s influenced by a differently numbered element nearby. It can even happen with short phrases: The posture of your blows are yet unknown. Before you feel too smug, consider that the person responsible for that last line was William Shakespeare. We’ll have more flattering things to say about him in the months to come. When I was quite small I went home from Sunday School one day and asked my mother what concord meant, and she said: Well it’s a big aeroplane that the British and the French are building together and it will go so fast that it will break the sound barrier. Oh, I said. So why does God love it? I love that anecdote, Liz. It seems only right that God would love Concorde, but why this should be an official part of the service is a more mysterious manoeuvre. False attraction seems to operate in many grammar check programs. And many writers, including journalists, seem to have lost confidence and accept the autocorrects. I hadn’t thought about that side of it, Edward. If it does, and writers submit to it (which is easy to believe), then that may explain some of the examples I see. False attraction seems to operate in many grammar check programs. It seems only right that God would love Concorde, but why this should be an official part of the service is a more mysterious manoeuvre. Yes – automated grammar-checking software is notoriously error-prone. There’s still a need, thank goodness, for human editors. They don’t shoot dead people, do they?